While the concubines were certainly part of the King’s regime of power, performing highly valued services in the service of their lord and master, they were not part of the war machine. The association of concubines was a domestic resource, a civilian population retaining a level of cultural and behavioral autonomy outside the military chain of command. When told to march, the concubines merely laughed. For Sun Tzu to defend his reputation as master strategist in the Art of War, he needed to break their autonomous will of the concubines and obliterate their laughter. To do so, he selected the most important “heads”- the ones who were thinking most intensely for themselves and their community – and then cut them off, delivering enough of a shock to the collective nervous system such that core impulses and identities might be reshaped, thereupon producing a new social body living by new codes. No longer paced by the rubato rhythms of concubinage, the ladies would subsequently conform to the tight martial locksteps of a drill team. Though Predator drones are intended to deliver the sort of psychological impact required by the Sun Tzu strategy, a remote-controlled drone does not have quite the same knowledge, rapidity, brilliance and control as a sword delivered by proximate animal energy via slashes from a single warrior. 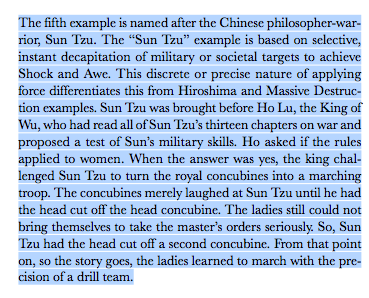 Further, when Sun Tzu orders the fatal blow, he has the implicit consent of Ho Lu, King of Wu, who has challenged him to demonstrate his philosophical mettle. Ho Lu may lose a valued domestic comfort, but he will gain fresh strategic insight into the Art of War. 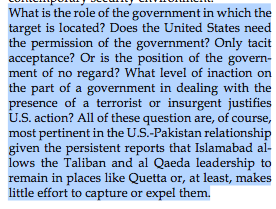 Let us now turn our attention to the lengthy series of Predator drone attacks in Waziristan. 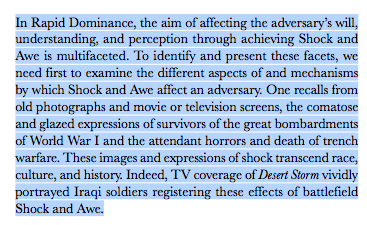 As defined within the doctrine of Shock & Awe, what is the strategic objective of these attacks? The announced public enemy convenes the usual demons: Taliban and Al Qaeda militants. Within the terms of the Sun Tzu example, however, we might imagine that the deeper objective resides in the destruction of the willful autonomy of the region, an autonomy which analysts believe to be supportive of an irritating culture of resistance to the policies of the United States. Possibly, the nonchalant reaction to ongoing civilian deaths in the delivery of lethal drone attacks belies the fact that such deaths are fully anticipated within the strategic plan to collapse the stubborn will of regional tribes, who allegedly provide the social context for individual “terrorists”. Otherwise, where are the congressional enquiries into Predator atrocities. Where are the international outcries, the calls for an independent War Crimes tribunal? Or is it that Wazir tribal populations do not even rank as human beings; they are merely things that move, as in the sentence “kill everything that moves”, a sentence with a long history inside The Shining City. Too much precision would lead to a deficit of fear and anxiety, and the psychology of the strategy requires that fear and anxiety reach a sufficient level to collapse the will and create the climactic desiderata of Shock & Awe, the glazed and comatose face of absolute subjection. Then the world would watch in wonder as the assembled tribes of Waziristan staged drill team competitions, with each team outdoing the next in replicating the twisted rhythms of American imperial fantasies. ALL PART OF THR PLAN? We know the damage — destroyed schools, communities, hospitals. They are civilians — children, women, families. Our losses are enormous. Generally people think that deaths caused by drone attacks should be treated as war crimes. There is so much animosity that perhaps the Americans are the most hated people in the minds of the people in Pakistan. When this hatred finds full expression, the psychologists of airborne decapitation will be left scratching their heads.